It's been just over a year since we began working on the GOV.UK beta website, and accessibility has been an important part of our activity during that time. As expert consultant on the project, I've been working with GOV.UK's accessibility lead Joshua Marshall, but accessibility hasn't stopped with the two of us. Everyone working at GDS is encouraged to think about accessibility, but it actually hasn't taken much encouragement at all. Designers, developers, editors, managers and analysts have all adopted the inclusive design philosophy. "Accessible design is good design. We should build a product that's as inclusive, legible and readable as possible. If we have to sacrifice elegance – so be it." Not everyone has had experience of inclusive design before they join the team, and we're working with relatively new technologies, so education is on-going for all of us. There have been talks on accessibility topics like the way screen readers handle web content, and validated learning through regular testing. Working in an agile way has been good for accessibility. It's enabled us to add new features to the site, test them quickly, and then rapidly make changes based on the feedback we receive. Because the site is updated constantly, we don't have to wait for a development milestone to be reached before we can test it. This makes it easier to identify and resolve accessibility problems before they really take hold. Testing is a crucial part of our approach. We routinely run technical accessibility checks throughout development. It's typical for a new feature to be checked two or three times in this way, before it's released. 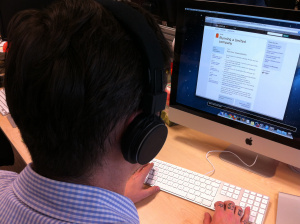 Most importantly we test the GOV.UK website for accessibility by asking people to use it. Over the past year we've regularly invited people with disabilities to help us evaluate the website and give us feedback. It's something we'll continue to do in the future because it's the best way for us to discover what's working and what isn't. GOV.UK is a huge and complex website, and there's more we want to do to make it even better. For it to be really inclusive we have to do more than audit it from time to time and stick an accessibility statement on the site to prove we've done it. We recognise that accessibility is an on-going commitment, not a one off certification process. By making inclusion one of our design principles, sharing knowledge and testing regularly, accessibility becomes a cornerstone of everything we do (and keep doing).